Labor arbitrators were presented with four cases to decide, each involving a challenge to discipline or discharge of an employee resulting from a work-family conflict. Arbitrators were randomly given versions of the cases in which the gender and one other characteristivc of the employee were varied. The results showed little evidence of direct gender bias in decision-making but did reflect bias against single parents and employees with eldercare, as opposed to childcare, responsibilities. Implications for other adjudicators, including judges, jurors and administrative agency officials are discussed. Do Cognitive Biases Infect Adjudication? 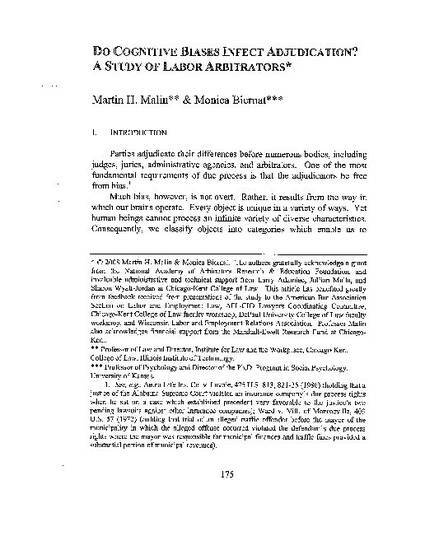 : A Study of Labor Arbitrators, 11 University of Pennsylvania Journal of Business Law 175 (2008) (with M. Biernat).